The Bahrain GP was arguably the first race of the Twitter era, for while the service was on the fringes of F1 last year, it really came of age during the February testing sessions. I was at the first day of the Valencia test when the world of F1 reporting was turned on its head by the huge level of interest on Tweets from journalists and team members at the track. Even my snap at the top of this page – showing Michael Schumacher leaving the garage for the first time – got over 5000 views. Most team PR departments have now embraced Twitter, but no one has done it with more enthusiasm than Lotus. 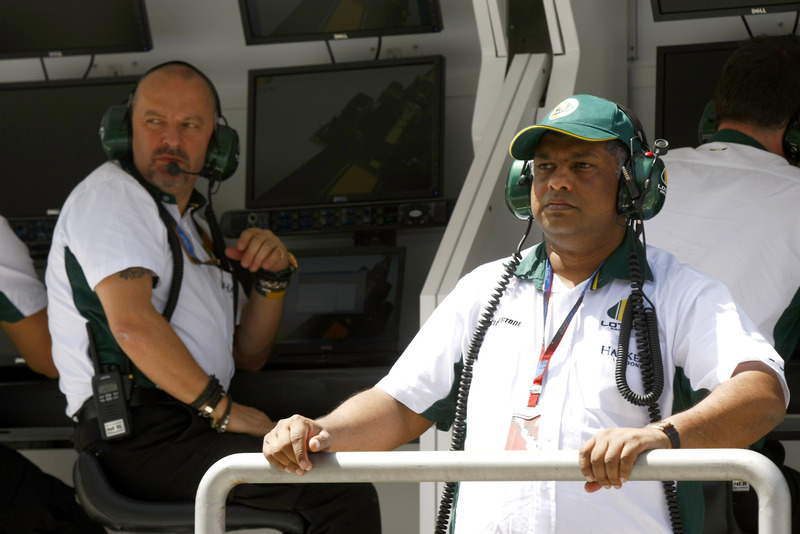 Tony Fernandes has kept us entertained with his random thoughts and news scoops, while Heikki Kovalainen has provided insights after stepping straight from the cockpit. Twitter rookie Mike Gascoyne got into it at the very first Lotus test day, telling us what was going on in the garage. Indeed at first I thought it was a wind-up or fake, and it was only after checking his early followers – who included a junior Gascoyne who was Tweeting in colourful language about her homework – that I was sure that this was the real Mike G.
Astonishingly, Mike continued to communicate from the pit wall during the Bahrain GP. I was busy watching the TV and timing screens in the Sakhir media centre, while listening to the BBC Five Live commentary. Thus I have to admit I only became aware of Gascoyne’s special service when the Beeb’s David Croft passed on an extraordinary message to the effect that Jarno Trulli would be pitting on the next lap. Pretty amazing stuff! While some team PR folk also relayed useful info, this was coming from the very heart of the team. did you see what mclaren.com offered during the race? that was even better than mike’s tweeting. the problem f1 now has, is that it’s arguably better to stay at home than go to a race, you’ll miss out by being there. No i didn’t see that and it is good stuff. But how live was it? And did they tell you when the drivers were going to stop? Bottom line is whether you’re there or at home there is now some amazing info available. Difficult for me to tell, since neither the official nor McLaren live timings worked on my computer during the sessions I watch online. Also Twitter was down for parts of the weekend. There are still teething problems with these excellent direct communication methods. From what I could see of practise, McLaren’s messaging seemed nearly live (as in, behind by no more than half a lap from the beginning of the event described). amazingly they told us all exactly when lewis was coming in, and he did exactly as they said he would. immediately they did the same for jenson and his confirmation radio message came through then he duly stopped in his box. i’ll be honest, i expected it to be a ruse, and maybe in future it could be used that way, but in bahrain mclaren were as accurate as mike was on the pitwall. one other odd turn of events. mclaren’s data was ahead of the live tv pictures in fp1, but remained in sync with the television throughout the rest of the weekend. I missed mclaren.com during the race but I was there during the qualifying session and if it remained the same then the info there appart from being gorgeous and good for entertaining purposes it really isn’t as good as Mike’s (or any other good team’s person) twits. I think that Williams’ spokeswoman Claire Williams (@clairevwilliams on twitter) even not being able to be at Bahrain also deserves mention, she did a hell of a job twitting the winter testing with lots of great photos from inside the pit I guess she will be at most of the races. It was like being on the pit wall with Twitter & F1’s live timing sharing my second screen. Pity the slow & tight Bahrain circuit (in my opinion) limited the excitement. But hey, it’s only the first race of the season and my man, Massa is looking good for the season. I actually feel that there would be less bad (british) press about the race had the McLarens been up there on merit. It would be nice to follow live timing and tweets during a race were it not for Speed Channel delaying the broadcast by at least a lap or 2. Why the ‘[sic]’ on the 2:24 tweet? Sorry in the UK we tend to have an extra ‘L’, as seen in modelling and things like that! I had my Twitter feed open, F1.com timing screen and the McLaren screen open during the race. Oh, with the TV showing BBC’s show. Was reading Tweets during the testing, a great source of info. Same during the race. It was nice to see the tweets from Mike, I wouldn’t have thought he’d have the time to do so. Sorely missed tweelts from ClaireVWilliams, she a great source of info from testing, and nice to get a feel of what happens during it. She should be at the remaining GPs. Not much from her boss during the GP over the weekend, so much for Clogger the Blogger. Being from the ‘social’ side of internet development I can’t say how good it is to see someone like mike tweeting and using that tool and resource to reach out to the viewers in a way no one else has in F1. The one thing I would like to see is audio/video streaming with the timing on formula1.com. It is a lot to ask,I know. Indycar.com has live video streaming during the race and you can also choose a car to view onboard if it is fitted with a camera. Yes i know, F1 had this… but very limited and pay only. The internet is the place to connect to fans, other then TV it is the best media source. Guess we are too technology focused, when can we get back to racing? Tweets are great but did MS,FA RB etc sign up to drive a car rounf a bit of tarmac so somebody could tweet or … to race a car? Please, which is more exciting? OK no answers based on Bahrain.